A strange, very arthouse fictional biopic chronicling the life of Celeste. Natalie Portman, Jude Law and Raffey Cassidy all give solid performances, as does Stacy Martin, but I had trouble with the structure of the story and several cringe-inducing scenes and dialogue exchanges. Willem Dafoe's narration felt unnecessary and pretentious, and the decision to have Cassidy play two characters was confusing and odd. Overall, a decent film, but definitely not a favorite. orijinal olmasa dahi gayet oturaklı bir fikir üzerine fazla sallanan bir anlatı kuruyor. cümlelerini belki biraz fazla yüksek sesle ve açıktan dile getiriyor ama bunun ötesinde asıl problemi onlar etrafına ördüğü hikayenin fazla işlemiyor olması. portman da -performansından bağımsız olarak- role pek oturmayınca anlatının odağı ve cümleleri iyice önemsizleşiyor, zira anlatım bunları iyi işleyip kalıcı kılamıyor. An ambitious attempt to explore the parallels between fame and infamy, and the ultimate emptiness that comes with their pursuit. The film explores some dark issues and Natalie Portman is not afraid to come across as very unlikable in her larger-than-life performance. The score by Scott Walker is very good, and the pop songs by Sia are appropriately catchy. If there were a way to give a negative score, I would have done it. Falls short in every aspect, especially in bringing its "message" of cultural decay with even a hint of nuance. Natalie Portman was awful in this role, failing to portray the character in a believable way both on- and off-stage (with the latter being a cruel joke and an insult to even the most shallow pop stars of this age). 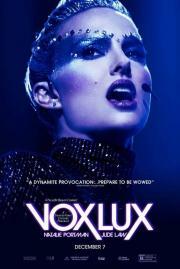 Vox Lux is a highly ambitious pop film about the society of the spectacle. Corbet talks about how contemporary society and terrorism are both symptoms of our society in decay. Both need little justification for their existence and both are followed endlessly in 24h news cycle. If this film had been made in the 1970's or in the 1990's as a form of pre-millenial tension, it might have been had some value as film of it's time. Now it seems not-so subtle spectacle of metaphors that don't quite land. Great screenplay, very well directed. The school shooting scene is impressive; there're some very good long dialogue scenes; Natalie Portman is incredible. The narration doesn't work all the time, it's effective part of the time. In general seems like a decent depiction of the world of pop and mainstream music, pushing to an extreme starting point. This movie deserved much more recognition. a film which tries so hard to make a statement about celebrity and pop culture but ends up falling into lazy, cynical, mean-spirited pre-poptimist clichés. the more i think about it, the more i find reasons to dislike this film. prolly underrating this, will see on a rewatch. interesting movie. I like this movie better and better. It’s extremely brave on almost every level despite its shortcomings. I also found it very intense though I might be the only one having that experience. Mostly just boring, but the big finale wasn't bad. Corbet births Celeste at a direct intersection of terror and pop-culture -- suggesting that these two things, along with our endless news cycle, can synonymize and feed into mega-stardom. It is a sick reality, and the film does not provide so much as a hopeful gesture in its entire runtime. It is sometimes shocking, sometimes vapid, and constantly in juxtaposition of itself both in content and in style -- "Vox Lux" is one of the most polarizing films I've seen of late. Vox lux is such an extraordinary, raw, and dramatic film. Natalie was a star.